Episode 11 of #SeriousVintage puts together our normal crew of myself (@GrandpaBelcher at Twitter), Geoff Moes (@ThallidTosser), and Josh Chapple (@joshchapple), with two people helping build a Vintage scene in Las Vegas, Joe McKellar (@JoeyMac399) and Heather Meek (@Revisedangel). We talk about this process as well as hitting on the You Make the Card results, some previews from Dragon’s Maze, and the all-important food and drink reviews from Las Vegas, in preparation for the Modern Masters Grand Prix in June. At the time of recording, You Make the Card voters had chosen to make a black enchantment, and within a few hours we learned they would be making a global enchantment, rather than an aura. This seems fine. Some of Vintage’s favorite enchantments are black global enchantments: Necropotence, Yawgmoth’s Bargain, Leyline of the Void, even some lesser-used hosers like Planar Void and Engineered Plague. Whether the YMTC card is good enough for Vintage still depends on its being printed with a unique effect or a powerful effect for a reasonable (i.e. cheap) casting cost. I don’t really think there’s a conspiracy going on for the #YMTC voting…but there could be. The final chapter in the Return to Ravnica, Dragon’s Maze, has presented some interesting possibilities for Vintage. I’m not sure anything is a certainty, yet. The two cards with the most Vintage buzz at this point are Ral Zarek, which we got to talk about, and Notion Thief, which wasn’t yet spoiled. Here, we talk about Wear//Tear, Beck//Call (or just Beck), Render Silent, Blood Scrivener, and planeswalker Ral Zarek. These cards, as well as others, will take some building and testing to see whether they make it to the big leagues or remain benchwarmers. Building a new Vintage scene is, as probably many of you have experienced at one time or another, difficult. Vintage has a negative reputation at times—too fast, too expensive, too swingy, elitist, too small (which, of course, is self-fulfilling)—so there are some Magic players who are prejudiced against giving the format a try. However, as we discuss with Joe and Heather, there are many players who are prime candidates to play Vintage. Legacy players already have many of the more expensive necessities like dual lands, Force of Wills, and Tarmogoyves; Commander players may enjoy the highlander aspect of the decks as well as own some of the powerful restricted cards; and some players, as they get older, might enjoy the more laid-back nature of a format that doesn’t have major shifts like some of the younger formats do. Even pimp cards and classic arts can be a way to get people into Vintage. 1. Make proxies attractive and easy. It would be nice to have an environment where everyone owns the cards, but most new players inevitably don’t. Don’t exclude them because of it. 3. Try to get store owners on board, not just as event hosts, but as financial participants. A store that hosts Vintage will sell Vintage cards that otherwise likely wouldn’t move. 4. Consider your prize support. Players would often be interested in Vintage cards, playable cards too, not just money cards like Moxes. Giving cards away also encourages players to stay in the format. 5. Emphasize that Vintage is a unique format where unique, fun, and powerful interactions happen regularly. Some players think it’s arcane and totally different from “regular” Magic, but it doesn’t have to be. 6. Talk to new players and help them improve. Be open rather than standoffish. Encourage players to try cards they like from other formats and consider alternatives if those cards don’t work (but see what happens if they do work!). 7. Point out that, because of proxies, Vintage is often cheaper than other formats. Buying cards from new sets often means picking up a handful of commons and uncommons for a few bucks. 8. Building a scene will take many small steps. Starting with a small group of two or four players might add one or two players a month. You’ll have to be patient and enjoy playing Vintage on a small scale in the meantime. 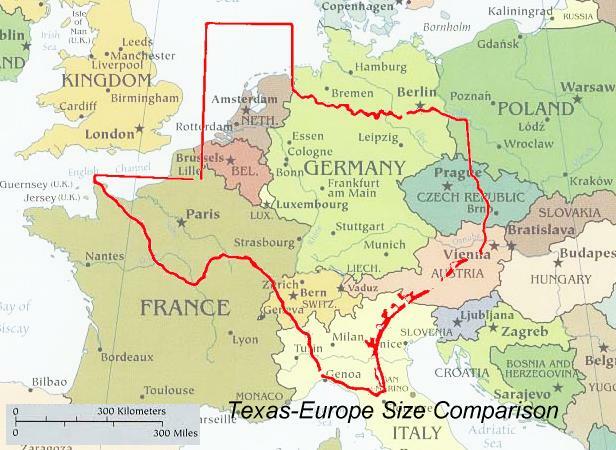 I also mentioned that this discussion would give me an opportunity to post one of my favorite images, comparing the size of Europe, where Vintage is more widespread, to the size of Texas, which has little Vintage because people and places are so spread out. The U.S. Northeast has a great scene because Boston, Philadelphia, and New York City are a few hours for each other and are part of a huge, interconnected megalopolis between Maine and Washington, D.C. Outside of that, population centers in the U.S. are fewer and farther between. Europe has reasonable rail travel; in the U.S., players are limited to car or plane, which isn’t worth it for smaller tournaments. It’s a question of population density: Europe has more people per square mile, so they have more Magic players per square mile, so they have more Vintage players per square mile. U.S. Vintage scenes are generally going to struggle to round up players. There is a lot of excitement surrounding the Modern Masters Grand Prix, scheduled for June 22 and 23 in Las Vegas, Nevada. The Modern Masters format sounds like a lot of fun, especially if the marquee cards work together for a powerful format. For Serious Vintage players, though, this event will be all about the food. Heather previously wrote a sweet guide to Las Vegas, which you can read, but we thought we’d get some additional tips as well. • Insert Coins – A video game bar not too far from the Cashman Center where the GP is being held. • Lotus of Siam – Recommended by David Williams and LSV for Thai food. • Komol – Also Thai food in the same strip as Lotus of Siam, but Heather recommends it over Lotus. • Secret Pizza – New York-style pizza, hidden on the strip. • Heart Attack Grill – Burgers and fries that will test the very limits of your life. If you weigh more than 350 lbs., you can eat for free! • Oscar’s – A steakhouse at the Plaza hotel where you can get a good meal, and also order a girl who will sit and talk with you while you eat. “The ultimate admission of loneliness, according to Geoff. • The Beauty Bar – A laid-back bar with shows and a good crowd of mid-20s professionals. • The Griffin and The Vanguard – Normal bars, in case things get too weird for you at the other places. For listeners and readers in the Ohio area, there are Vintage tournaments coming up where you can hang out and game with the Serious Vintage crew. Who knows? If you’re there, maybe you’ll even end up on the show!